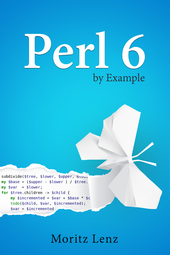 This blog post is part of my ongoing project to write a book about Perl 6. If you're interested, either in this book project or any other Perl 6 book news, please sign up for the mailing list at the bottom of the article, or here. It will be low volume (less than an email per month, on average). In the two previous installments, we've seen Python libraries being used in Perl 6 code through the Inline::Python module. Here we will explore some options to make the Perl 6 code more idiomatic and closer to the documentation of the Python modules. Python is an object-oriented language, so many APIs involve method calls, which Inline::Python helpfully automatically translates for us. But the objects must come from somewhere and typically this is by calling a function that returns an object, or by instantiating a class. In Python, those two are really the same under the hood, since instantiating a class is the same as calling the class as if it were a function. This uses the subplots symbol (class or function) as a method on the module matplotlib.pyplot, which the import statement aliases to plt. This is a more object-oriented syntax for the same API. This makes the functions' usage quite nice, but comes at the cost of duplicating their names. One can view this as a feature, because it allows the creation of different aliases, or as a source for bugs when the order is messed up, or a name misspelled. How could we avoid the duplication should we choose to create wrapper functions? This is where Perl 6's flexibility and introspection abilities pay off. There are two key components that allow a nicer solution: the fact that declarations are expressions and that you can introspect variables for their names. The first part means you can write mysub my ($a, $b), which declares the variables $a and $b, and calls a function with those variables as arguments. The second part means that $a.VAR.name returns a string '$a', the name of the variable. Instead we must use |args to obtain the rest of the arguments in a Capture. This doesn't flatten the list of variables passed to the function, so when we iterate over them, we must do so by accessing args. By default, loop variables are read-only, which we can avoid by using <-> instead of -> to introduce the signature. Fortunately, that also preserves the name of the caller side variable. Class PyPlot inherits directly from Mu, the root of the Perl 6 type hierarchy, instead of Any, the default parent class (which in turn inherits from Mu). Any introduces a large number of methods that Perl 6 objects get by default and since FALLBACK is only invoked when a method is not present, this is something to avoid. The method TWEAK is another method that Perl 6 calls automatically for us, after the object has been fully instantiated. All-caps method names are reserved for such special purposes. It is marked as a submethod, which means it is not inherited into subclasses. Since TWEAK is called at the level of each class, if it were a regular method, a subclass would call it twice implicitly. Note that TWEAK is only supported in Rakudo version 2016.11 and later. Passing in any other wrapped Python module than matplotlib.pyplot results in a type error. Perl 6 offers enough flexibility to create function and method call APIs around Python modules. With a bit of meta programming, we can emulate the typical Python APIs close enough that translating from the Python documentation to Perl 6 code becomes easy.